One of the pleasures of exploring Uzbek cities is discovering the splendid decorative panels on residential apartment blocks and government buildings. From time to time I will post images of my favourites. Following the devastating 1966 earthquake in Tashkent, a massive reconstruction effort took place. With more than 100,000 people homeless, the USSR dispatched workers from all its republics to build a model city. It took 1,000 days for the new Tashkent to emerge. The earlier city master plan, already well underway, incorporated administrative buildings, apartment blocks, parks, cultural and sporting complexes fusing traditional Central Asian design elements and architectural practices for a modern, industrialising city. This plan was adapted to factor in seismic-safe construction practices. Many high-rise buildings were richly and elegantly decorated in mosaics depicting Uzbek themes, heroic workers, floral and geometric patterns. Some panels could be identified by the construction workers who built a specific apartment block, e.g. Ukrainian symbols. Highly-skilled artists were commissioned to design the panels and the cityscape of Tashkent became notable for these marvellous works. 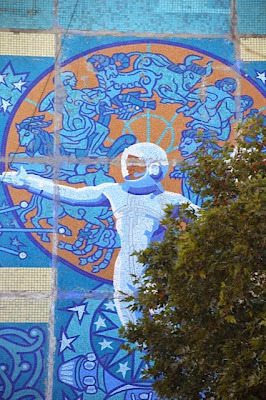 These panels are not just found in Tashkent. There are gems in Ferghana Valley towns, as well as Samarkand, Khiva, Nukus and Termez. Ferghana Valley: glorifying workers, learning and cotton! Some visitors to Uzbekistan ignore these panels and focus solely on the bland architectural style of the Soviet blocks. I believe that these mosaics form part of the rich, social history of the country. 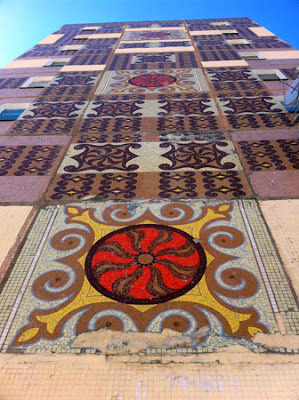 (I am also alarmed that some buildings with splendid mosaics have been demolished). My hope is that an Uzbek photographer will document the panels before it is too late. It would be a perfect subject for a coffee table book, complete with stories of the artists who produced them, some of whom are still living in Tashkent today. 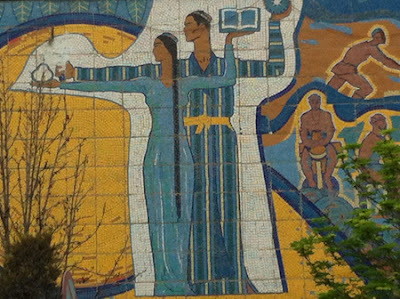 Many of the artists also composed the stunning panels that decorate the stations of Tashkent's metro. The website My Tashkent had a recent article on this topic featuring the work of the Zharskie brothers who created many panels. It is in Russian, but well worth a look at the stunning photographs. The red-bandana Young Pioneers is a classic. If you have a little spare time in Tashkent you can easily enjoy a day roaming around discovering these artworks.